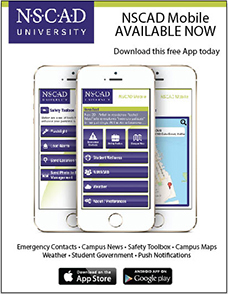 The free, downloadable NSCAD Mobile App provides easy access to emergency phone numbers, student wellness services and severe weather closure notifications. The Frank G. Lawson Career Information Centre is a valuable component of the career services provided by the Dalhousie University. It maintains a career resource collection on the 4th Floor, Student Union Building. Download a list of ART AND CULTURE ORGANIZATIONS here. Click here for information about INTERNSHIPS available to NSCAD Students.